We awoke to a beautiful morning and temperature of 60 degrees. We had a great breakfast of those fresh eggs from Illinois. The difference in the fresh egg and the ones we buy in the grocery store is that the fresh eggs have VERY yellow yolks. The overall taste is more rich and we really enjoyed our hot breakfast. We drove through back roads of Iowa this morning with names such as Titonka, Lakota, and Pukwina. We drove through Elmore, Iowa, population 735, and it had a huge golf course and country club. We thought it was interesting that such a small town had such a big CLUB. We hit interstate 90 mid-morning and the winds were rough going across Minnesota and into South Dakota. 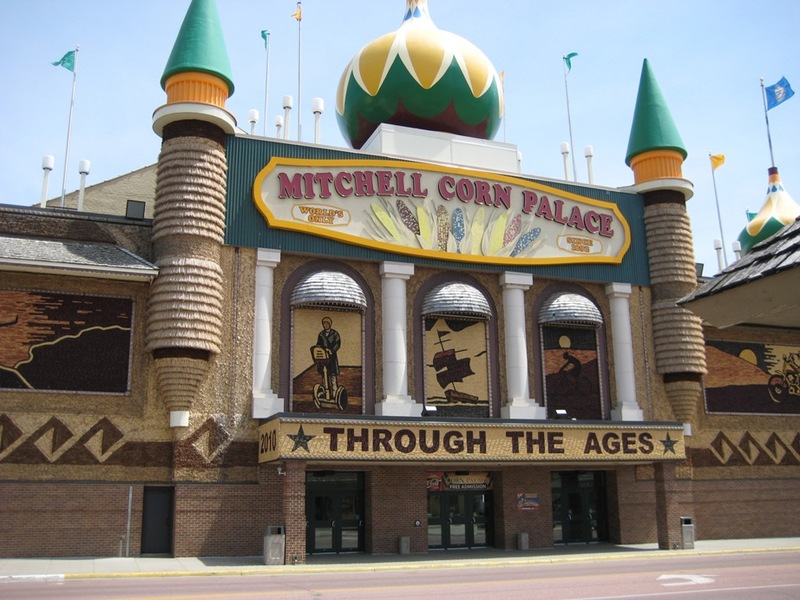 We stopped in Mitchell, South Dakota to visit the famous Corn Palace. This is a folk art wonder and the idea was hatched in 1892 by a local person thinking it would be a good idea to showcase the local crops grown in the area. This is a celebration of the fertility of the land and productivity of the local people. 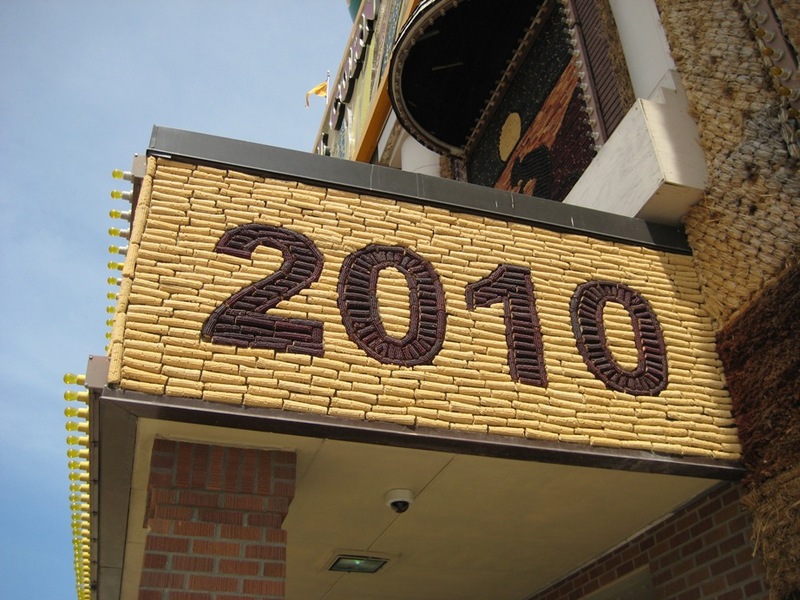 Each year a new decorating theme is chosen and the outside of the Corn Palace is stripped and redecorated with new corn and grains. 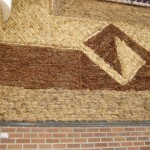 Over the summer each year 3,000 bushels of milo, rye, oat heads, and sour dock are tied in bundles and attached. 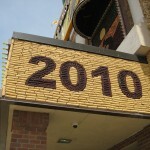 The corn murals have to wait until late summer when the corn crop is ready. 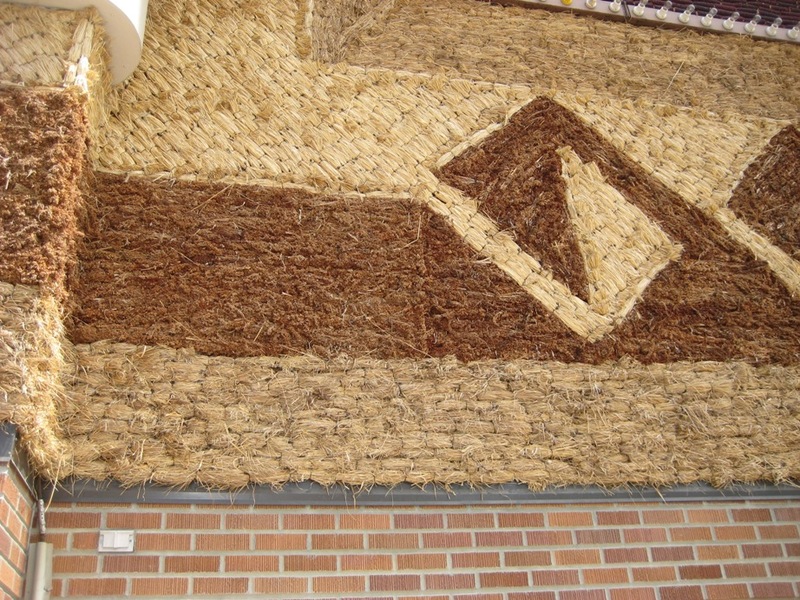 Over a half million ears of corn are sawed in half and nailed to the building following patterns created by a local artist. And just imagine every year the theme is changed!! 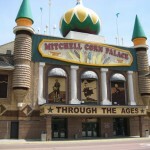 The inside of the building has photos through history of the different themes used on the Corn Palace. It was very interesting! We stopped for the day in Oacoma, South Dakota. Our dinner this evening was shrimp alfredo. 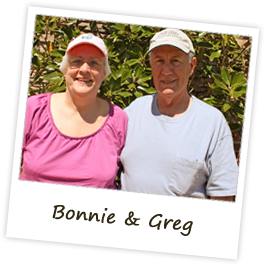 Tomorrow we will drive across South Dakota and probably stop at Wall Drug and end the day in Deadwood, South Dakota, where we will spend some time sight seeing in the area. Shrimp Alfredo in South Dakota? They didn’t have treadmarks on them did they? We have been to Wall — it is so neat. One HUGE drugstore!!!!!!!!!!!! Sounds like you guys are in Heaven. Be safe. Jeff has been in Deadwood on his motorcycle. He says it is beautiful. Sounds like a wonderful trip. What gorgeous scenery!! It’s funny that we crossed the country from the opposite side and hit the spots you WILL be stopping at. We winter in AZ, left there on 4/5 and headed up to Seattle for 10 days, then started to head east. We are now settled in Utica, IL for a couple more weeks, before going up to Marengo, IL for a month. Then we drive all the way to the east coast, NC, for a wedding. We’re like two ships passing in the night!